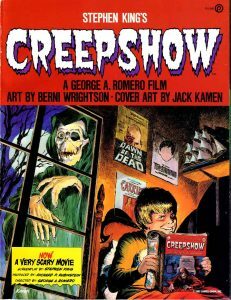 Originally published in 1982, Creepshow was a collaboration between Stephen King and the late comic artist Bernie Wrightson to illustrate five short stories in a graphic novel format. It is a graphic adaptation of the George Romero film of the same name in which King wrote the screenplay. Both film and book purposely have a retro look which comes across as an imitation, or perhaps more accurately a tribute, to the earlier 50s horror comics most notably in style to EC Comics. The book even features a ghoulish host, like the comics had, who would briefly introduce each story. The book has been out of print for a while but it is being republished. The question is, do the scares of the 80s still impress in the 21st century? It really isn’t a very hard question. While King has recently concentrated more on mysteries, he still remains the great horror genre icon. When it comes to horror, Bernie Wrightson was the art equivalent of King and stayed in the forefront with his stark lines and dark subjects. It’s not a surprise in how well both adapted to this tribute of the 50s horror magazines since they have both expressed their love for the comics and noted EC as a major influence. Yet Creepshow isn’t just a nostalgic trip back to either the 50s or the 80s. It still dazzles with the artist’s bright colors and the author’s stark to-the-point tales. What stands out in this second reading is that King may not be just writing a tribute to early comics but highlighting a particular theme that still rings true in the popular media whether through writing, drawing or filming. In “Father’s Day” we have the ubiquitous revenge from the grave story. “The Crate,” which was first published in Gallery magazine in July 1979, covers the henpecked and miserable husband who finds the cure to his dilemma in a terror kept in a crate. “Something to Tide You Over” replays a popular topic from King’s earlier short fiction – rich men, adultery, revenge, and comeuppance. And finally “They’re Creeping up on You” is a tale reminiscent of Twilight Zone in which an evil man is brought down by what he fears the most. Through these four forays in dialogue and art there is a consistent theme of revenge and justice that was prevalent in the old EC Comics. Creepshow continues that theme with a bit more bite from King and lots more color from Wrightson. But a fifth story doesn’t fit that theme and for my money it is the best one. “The Lonesome Death of Jordy Verrill” was originally King’s story “Weeds” and in its prose form appeared first in Cavalier magazine in May 1976. It is pretty much a rip off of Lovecraft’s “The Colour out of Space” and succeeds beautifully as it shifts the focus on one character, the simple Jordy, as he suffers from his meteoric find. Jordy brings humor (“Yuck! It’s meteor crap!”) and pathos to the story. In the movie, Jordy is played by Stephen King but Wrightson wisely keeps his features a bit vague. You don’t need to read the Lovecraft story to appreciate this one but it wouldn’t hurt. Creepshow doesn’t just age well. It still feels both fresh and vintage at the same time. The stories still ring true for the genre and the love many have for the old comics is respected. Now if they would only repackage the movie. Blu-Ray anyone?